Grace Chapel Church of the Nazarene (formerly Hooksett Church of the Nazarene) started in Hooksett in 1927. Our congregation continues to serve the community in a variety of ministries. We are comprised of loving and compassionate people who warmly welcome you to worship with us. We are part of the International Church of the Nazarene with its headquarters located in Lenexa, Kansas. The Church of the Nazarene is a Protestant Christian church in the Wesleyan-Holiness tradition. Organized in 1908, the denomination is now home to about 2.5 million members worshipping in more than 29,000 local congregations in 162 world areas. Grace Chapel recently called Rev. Roy Funk to be its Senior Pastor. 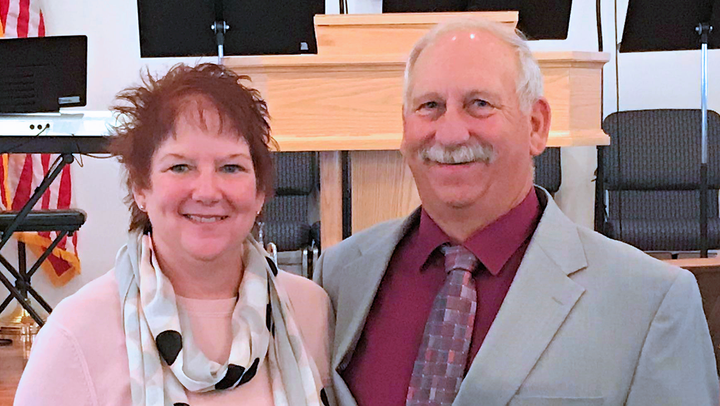 We welcome Pastor Roy and his wife Becky as our new spiritual mentors and leaders. They have been residents of Hooksett for 30 years and raised 3 children here. They also have 4 grandsons! Pastor Roy served in many areas of lay ministry while employed full-time in the construction industry. Following God's call, he returned to school. While serving as our Associate Pastor, he earned his pastoral degree. Pastor Roy says, "I am excited to serve Grace Chapel and our community as we reach out to share God's love and compassion."